I was disgusted and afraid. He, on the other hand, was angry, very angry. The yellow-green phlegm the Somali policeman spit on the heated ground landed, copiously, a few feet from where I had just squatted to snap a photo of the adjacent building. Then, moving to step on his yuck, he cleared his throat once more, and cocked his gun. “Get up from there. I tell you to stand up,” he screamed. The clock had just chimed midday. The sun was scorching. Tens of passersby, wearing multihued sarongs and white turbans, were walking to the nearby mosque. The muezzin’s call to Friday prayers blared from the megaphones. Sweat dripping from his chin, green khat leaves filling his mouth, my assailant moved closer, his finger on the trigger. I was standing in front of the Somali National Theater, a maroon, two-storey brick building in Mogadishu that was once home to the Hobollada Waaberi (Dawn Singers), a troupe of Somali artists who performed memorable poetry and plays that ran from the sly to the slapstick. The theater is less than 400 meters up the Mecca Al-Mukarramah road from the former presidential palace, where on many occasions the dictator Siad Barre, whose government was ousted by warlords in 1991, sat to enjoy the songs of musicians like Halimo Magool, Hibo Nuura and Hassan Adan Samatar. Twenty years after civil war first engulfed Somalia, the building, like so many iconic structures in Mogadishu, has become a relic. In early April, after months of relative calm, an explosion rocked the theater, killing eight people. Among the dead were the head of Somalia’s Olympic committee and the chairman of the Somali football federation. In response, security had been tightened. Middle-aged men, with blood-shot eyes and wearing army fatigues, stood guard, eyeing bystanders with suspicion. Other soldiers sat on tattered mats listening to music in the shade. Like an ode to the old theater, guitar songs, plaintive and treacly, poured from their makeshift radios. It became clear that the policeman, whose finger remained on the trigger, wasn’t going to allow us to take photos, let alone go inside of the theater. Dejected, my guide Jamal and I crossed the street to the Guriga Hooyooyinka (Women’s Association House). Built in 1985, six years before Somalia descended into chaos, the house has, until recently, remained a squatter’s haven for internally displaced persons. Although under renovation, the building showed telltale signs of destruction. We passed over mounds of twisted metal, shards of glass, and smashed concrete before emerging to the top of the partially-restored four-story facade. Mogadishu. There it was below us, around us. The white and grey architecture. The blue horizon of the Indian Ocean. The harried residents. Mogadishu. The humidity enveloped me. It dripped from my back, as if the city were weeping out of a mix of fear, frustration, and fondness. “Il Teatro Nazionale,” read the sign over the entrance of the theater we had tried to enter before. Off to the right, I could see the ruins of the monument to the Daljirka Daahsoon (Unknown Soldier), erected to honor those who died in defense of the Somali Republic during the colonial era. Just up the road, the newly renovated white minarets of the Isbaheysi Mosque cast a commanding presence, while the former Somali National Assembly, a building that once epitomized Somalia’s sovereignty, leered nearby, vacant, having lost all national significance, an emblem of the lawlessness that engulfed this country for decades. 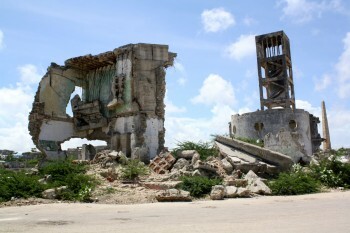 Despite recent overtures towards the formation of a new government and the adoption of a new constitution by August 2012, incessant fighting, first between clans, and then between government forces and the militant group al-Shabaab, continues to plague Mogadishu. From the top of the rubble heap, I glimpsed the ravaged rooftops of the Hamar Weyne neighborhood, the old town, its magnificent, centuries-old neem and propis trees, its pulverized homes and churches of Italian design, its garbage piles and bands of wandering sheep. But for all of the wreckage stretched out before me, there was cause, nevertheless, for a modicum of good, sober cheer. It struck me that the destruction was, for the most part, done with — that the buildings around me weren’t being actively obliterated. The dust on the rubble was settling and that is always the first step towards starting over. Perhaps the best view of Mogadishu runs from the theater towards Lido Beach to the east. 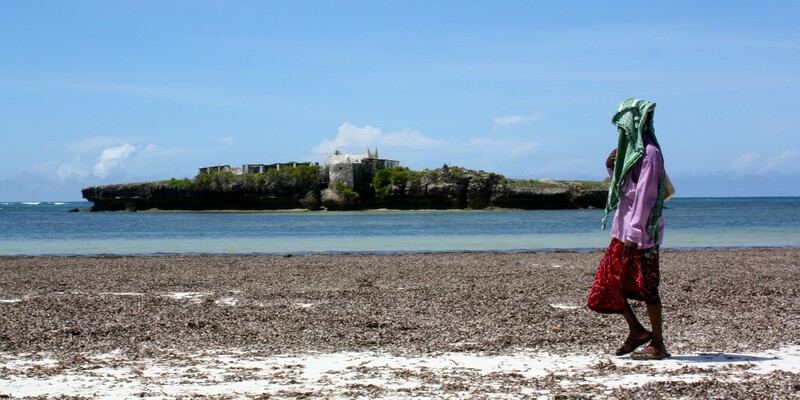 Since al-Shabaab was ousted from the city in August of last year, people have begun to venture back out onto the sands of Lido. The salty breeze coming from the seaside has recaptured the imagination of both locals and those who fled during the chaos, inviting them to splash in the surf and sprawl on the sand dunes without fear. Today was particularly ideal for the beach, I thought. It was Friday, the start of the weekend. Lido would be packed. Just then, I felt a tug on the back of my Polo shirt, jolting me from my reverie. A lean Somali man, with a trimmed salt-and-pepper beard, dangling an AK-47, faced me. Looking past him, I saw that Jamal was smiling. “Are you happy? Are you done?” the guard asked. “I am more than happy,” I replied. Abdi Latif Dahir is a reporter living in Nairobi. His writing regularly appears in the Africa Review and Kenya’s Daily Nation newspaper.